These are a 10! After making these many times, I can tell you that you really need to make them ahead of time. Cut chicken into 2-in. x 1-1/2-in. strips. In a large re-sealable plastic bag, combine the garlic powder, pepper, seasoned salt, and paprika; add chicken and shake to coat. Stuff each jalapeno half with cream cheese. Wrap jalapeno halves and onion with chicken. Wrap each with a piece of bacon and secure with toothpicks. Grill, uncovered, over indirect medium heat for 20 minutes or until chicken juices run clear and bacon is crisp. 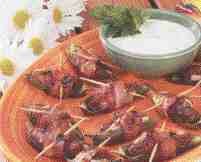 Serve with blue cheese or Ranch dressing. Yield: 2-1/2 dozen. A small green chile pepper that is mildly hot. They are named after Jalapa, the capital of Veracruz. Serrano peppers are a good substitute when there are no jalapenos on hand. Peppers originate from Central America where most of the main varieties were developed by local Indians. Once peppers were discovered by the Spaniards and Portuguese they were rapidly introduced worldwide and eagerly incorporated into local cuisines. Sweet peppers can be eaten raw or cooked; chili or hot pepper are used in seasoning. The wild form of this species is native from Florida and the Bahamas to Arizona and down though Central America to Colombia. Seeds have been found in archaeological excavations dating to before 5000 BC in the Tehuacan Caves at Puebla, Mexico. Evidence suggests that by 3500 BC, Capsicum annuum was under cultivation. Other species of Capsicum are also grown (e.g. Capsicum frutescens is the main ingredient of Tabasco sauce) but Capsicum annuum has produced almost all the varieties of chilies and peppers. Varieties can be either sweet or hot and come in a variety of colors. 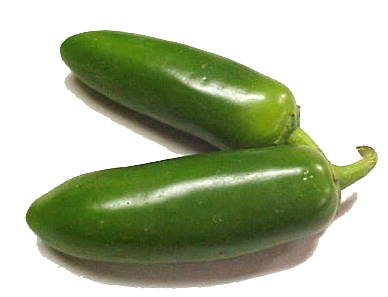 The green pepper is an unripe red or yellow sweet pepper. Cayenne pepper and paprika are also derived from varieties of C. annuum (CHECK). The hot flavor of chilies is caused by the substance capsicin which is concentrated mainly in the placenta (i.e. the connective tissue between the fruit and the seeds) and the seeds. A single mutation of a particular gene turns off capsaicin production to produce a sweet pepper. Capsicum species were brought back to Europe by the Spaniards in the late 1400's and early 1500's and soon became enormously popular as they could be easily grown in gardens and could be used as a replacement spice for Pepper Piper nigrum which was very expensive. Chili peppers were probably introduced to Africa and Asia by the Portuguese and in Asia in particular, became widely grown and incorporated extensively into local cuisine. Many of the varieties of Capsicum annuum were developed by New World Indians before European invaders arrived. Modern breeding has tended to concentrate on developing new sweet pepper cultivars.